Hand craftsmanship, attention to detail, selection of the finest materials -- these are features that ensure your Katz-Messenger windows will last for many generations to come. In fact, well-built stained glass windows often survive the buildings in which they were originally installed. Stained Glass Artist, Designer & Project Manager "Glass is absolutely inspirational...I have been truly blessed to find a niche that uses every bit of my skills...one that is a constant source of learning and inspiration." Raised in the suburbs of Chicago, Roberta Katz-Messenger received her education from Blackburn University, the Chicago Art Institute, and Goodman School of Drama. In 1969, a move to Denver with friends serendipitously introduced Roberta to what was to become her life-long love -- stained glass. It was here she met and apprenticed with Rhonda Dixon, a European-trained stained glass artist. Then in 1972, seeking a more rural lifestyle and an opportunity to expand her stained glass skills, Roberta moved to Clinton, Arkansas, and opened Pentacle Studio. Roberta showed the works of over 100 other Arkansas artists and artisans in the Pentacle Studio Art Gallery. Now Roberta, together with her husband Steve and their staff, continues to build stained glass projects for individual homes, as well as for liturgical and commercial projects. Several of their private commission pieces have been featured in publications such as Sterling/Lark Publishing Co.'s Stained Glass Basics, and Rodale Press' Handmade Cabinets and Doors. They were also an important part of a recent glass exhibit at the Pine Bluff Arts & Science Museum. "Working with stained glass is very rewarding... each project is different...I especially enjoy seeing the finished piece in place, how its unique design and colors collect light and enhance its surroundings...it can be breathtaking." Steven Messenger was born in Santa Monica, California, and raised in Des Moines, Iowa. He attended Drake University and served in the Navy during the Vietnam War. After his tour of duty was completed, he returned home to work in the computer industry. In 1978, looking for a career and lifestyle change, Steve Messenger moved to Fort Smith, Arkansas. The move introduced Steve to the construction industry. It also introduced him to stained glass. At night, for relaxation, he took stained glass classes at the Merry Go Round Glass company. During the mid-80s, Steve once again found himself on the move, this time to Alread, Arkansas, to work as a production foreman for a company that designs and handcrafts oak furniture. But like his move to Fort Smith, this move also had a second "purpose". While delivering a project to a local art studio, Pentacle Gallery, he met Roberta Katz. Three years later they became husband and wife. Steve and Roberta's combined talents -- hers in design and production and his in production and installation -- led to the development and success of Katz-Messenger Stained Glass. In 1972, Roberta Katz opened Pentacle Stained Glass Studio in Clinton, Arkansas. It was an auspicious beginning as she sold her first window to a local client who later became a collector of her work. Shortly after, Roberta realized that other artists and craftsmen needed a place to show their work. Pentacle Stained Glass Studio became Pentacle Gallery, a showcase for over 100 Arkansas artists and artisans. As Pentacle Gallery grew, so did the number of stained glass projects. Roberta Katz became Roberta Katz-Messenger, marrying her skills and heart to Steve Messenger whose skills lie in the construction industry, stained glass, and production management. Over the years, autonomous pieces and residential commissions expanded to liturgical and commercial projects. By the late '90s it became clear that their stained glass production needed more space. 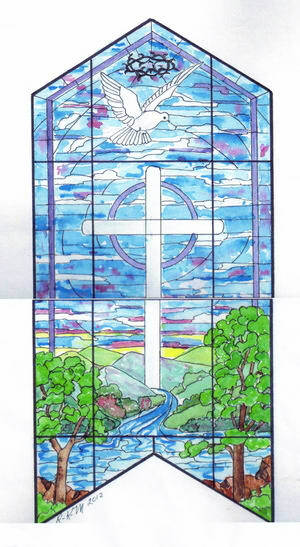 In January of 2000, Roberta and her husband Steve relabeled their enterprise as Katz-Messenger Stained Glass. The company is located two miles outside of Clinton, in a rustic setting that provides a creatively inspiring work space for Roberta, Steve and their staff. Although they continue to design and produce private residential commissions, their primary focus is liturgical and commercial windows. Over the last few years, they have completed several church projects in a wide range of designs and techniques. 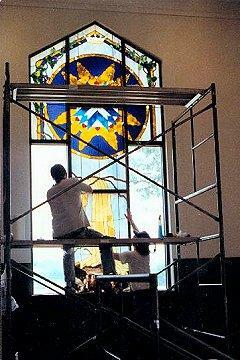 Katz-Messenger Stained Glass relies on a team of full-time and part-time employees. All are well trained in various aspects of stained glass production, and are skilled artisans in their own right. In addition, depending on the project, Katz-Messenger Stained Glass uses highly experienced independent stained glass designers and artists. 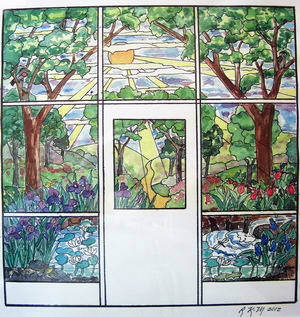 One such artist is Debra Strack of Conway, Arkansas, whose work is featured in Sterling/Lark Publishing Co.'s Stained Glass Basics. She recently showed her work, along with Roberta's, at the Pine Bluff Museum of Art and Science. 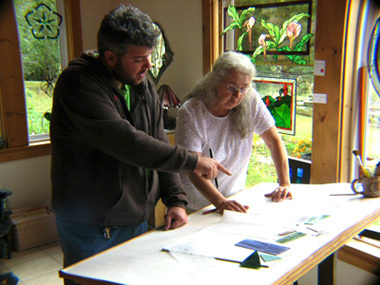 Brad Bergdoll (right, with Roberta Katz-Messenger) recently completed his first ambitious stained glass piece after working with stained glass, repairs and installations over the past year. Brad is a great addition to the team.